Whether you suffer from allergies or respiratory problems, or you just want to improve the air quality in your home, consider installing an air filtration system as part of your home's furnace. Whole house air filtration systems work to remove particulates and gasses from the air in your home, improving the air quality. Select an air filtration system based upon what it is you hope to eliminate from the air. For example, if you or someone in your family suffers from allergies, consider a filtration system that removes the specific types of particulates that are harming your health. If your home has tested positive for radon or carbon dioxide, or you or a family member are particularly sensitive to VOCs, install an air filter designed to remove hazardous gasses instead. All air filtration systems are rated by the Association of Home Appliance Manufacturers, as well as by the American Society of Heating, Refrigerating and Air-Conditioning Engineers for the rate of clean-air delivery rate. According to Shawn Laskoski, Vice President of Product Marketing at Trane, "Clean air delivery rate is defined simply as air flow rate times air cleaning efficiency. This measure is recognized by the American Lung Association and the Environmental Protection Agency as an effective means of comparing various air cleaning devices. The higher the clean air delivery rate, the more effective the unit is at cleaning the room or home of airborne particles and allergens." There are countless whole house air filtration systems on the market. These four have high ratings and systems that will work to efficiently purify the air in your house. Laskoski explains, "Trane CleanEffects uses a powerful, patented ifD corona field to charge incoming air, causing particles to adhere to the CleanEffects collection cells as air passes through. Since your furnace or air handler isn't struggling to work against a clogged filter, clean air flows freely. Trane CleanEffects has been performance-tested with the results verified by professors from the Harvard School of Public Health." Trane CleanEffects has no filters, which makes installation and maintenance easier than some other models. This system works particularly well in homes where particulates and allergens are the aim for reduction. 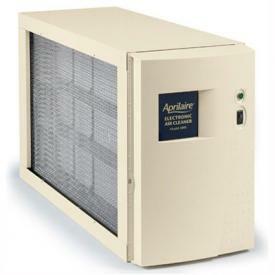 The Aprilaire 5000 is an air cleaner that uses an electrical field to charge particulates entering the filter, causing them to adhere to the media, filtering the air in your home. It has a one-touch control that is rated highly by consumers, and when installed properly is extremely effective at removing allergens and dust from the air. If you're concerned about odors and gasses as well as particulates, consider the Lennox PureAir. This electronic filter system utilizes UVA light to help destroy not only particulates and vapors, but ozone - a lung irritant - as well. The PureAir filter gets a MERV score of 16 - the highest score available from the American Society of Heating, Refrigerating and Air-Conditioning Engineers, and consumers rate it highly for its ability to reduce allergens in the home. The IQAir Perfect 16 gets its name from its MERV score of 16 - the highest rating given to whole house filters. The IQAir Perfect 16 uses a uniquely shaped media to give you more than 170 square feet of filter media for high performance. 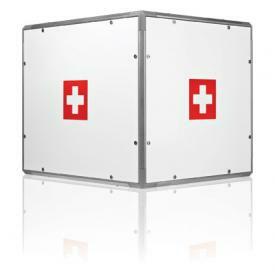 They guarantee a minimum of a 90 percent reduction of allergens and poor air quality in your home or your money back. All IQAir units are installed by their trained technicians who preform air quality tests before and after installation. 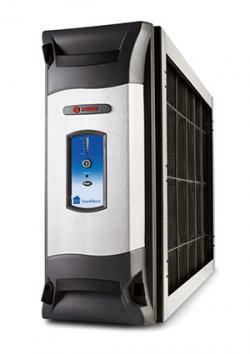 Whole house air filtration systems are installed directly to your existing HVAC system. They are connected to your furnace's ductwork to ensure that all circulating air passes through them. Most air filtration system manufacturers recommend an experienced HVAC installer handle the installation of your filtration system as well. This is because every air filtration system is slightly different, as is your existing HVAC system. If you choose to install the unit yourself, follow the manufacturer's instructions closely for best results. Shut off the power to your HVAC unit. Disconnect the bottom of your ductwork from the side of your furnace. Measure up approximately 18-inches and cut straight through the duct, all the way around. Measure up approximately 12-inches from the first cut, and make a second cut around the duct. Remove the bottom section of the duct. Position the air filtration system next to the furnace, lining it up with the duct vent. Screw the system into place. Screw the bottom section of the ductwork to the other side of the filter system. Extend your ductwork back to meet the top section using the sheet metal and screw it into place. Plug in your filter unit and restore power to the area. Make a difference in the quality of your home's air with a whole-house air filtration system. Have one of these units installed with your furnace and see what a difference it makes to the air you breathe in your home.